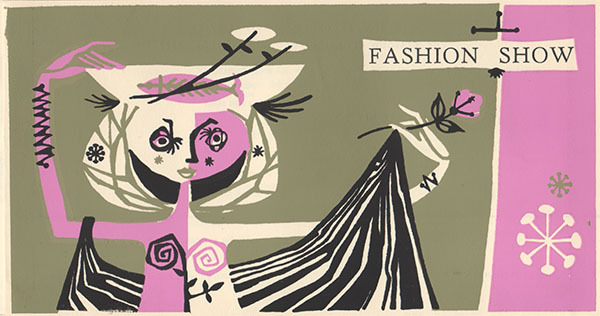 This month, the Archives and Collections are celebrating all things fashion! 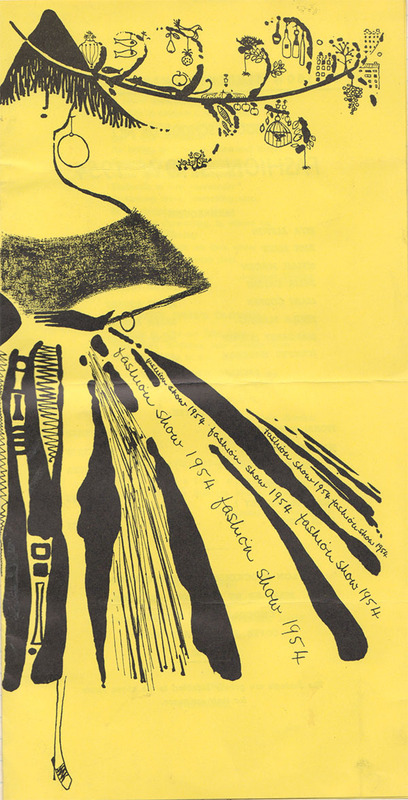 As well as the School’s annual Fashion Show on the 21st and 22nd of March, there is currently a glamorous collection of our archive material on display in the corridor of The Reid Building until the 26th. 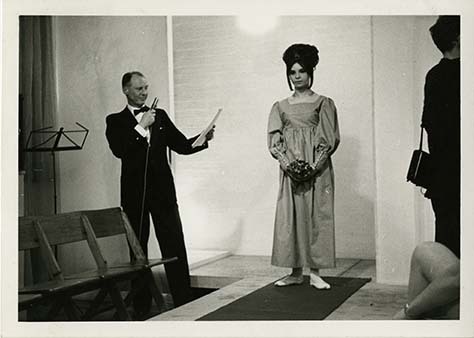 In the first of two posts, we will look at the history of the GSA Fashion Show from its humble beginnings in the 1940s. Poster for the 2017 Fashion Show organised by 3rd year Fashion and Textiles students. Poster features Archive Reference GSAA/P/1/2420. Photographer Robert Burns. Image courtesy of Zephyr Liddell. 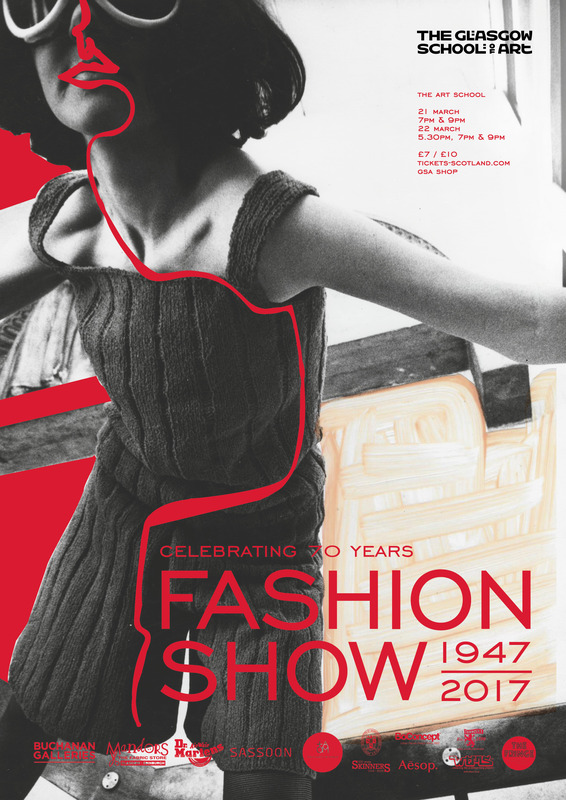 Poster for The Glasgow School of Art Fashion Show 70th Anniversary Exhibition featuring various images from the Archives and Collections. Image courtesy of Helena Britt. An exhibition of material which celebrates 70 years of GSA Fashion Shows has now been on display in the Reid Building for over a week. Opening night on the 3rd of March was a vibrant success, sparking heartfelt reminiscences from GSA alumni past and present. 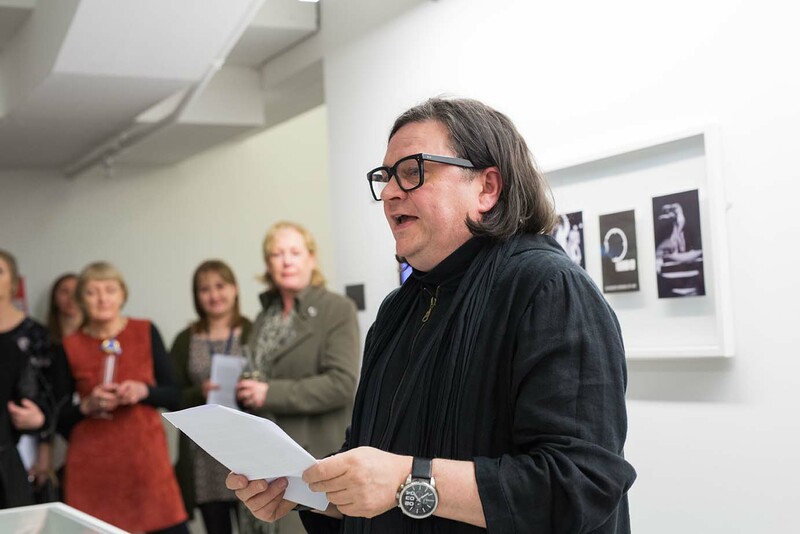 For more images of this event, courtesy of © McAteer Photograph visit GSA’s Flickr page. GSA’s Head of Fashion and Textiles Jimmy Stephen-Cran opens the exhibition with his reflections on the School’s previous fashion shows. Image courtesy of © McAteer Photograph. GSA alumni admire the material and share stories. Image courtesy of © McAteer Photograph. In 70 years, the format, location and emphasis of the fashion shows has changed and yet collaboration, team working and GSA’s Students Union have remained central to their organisation. 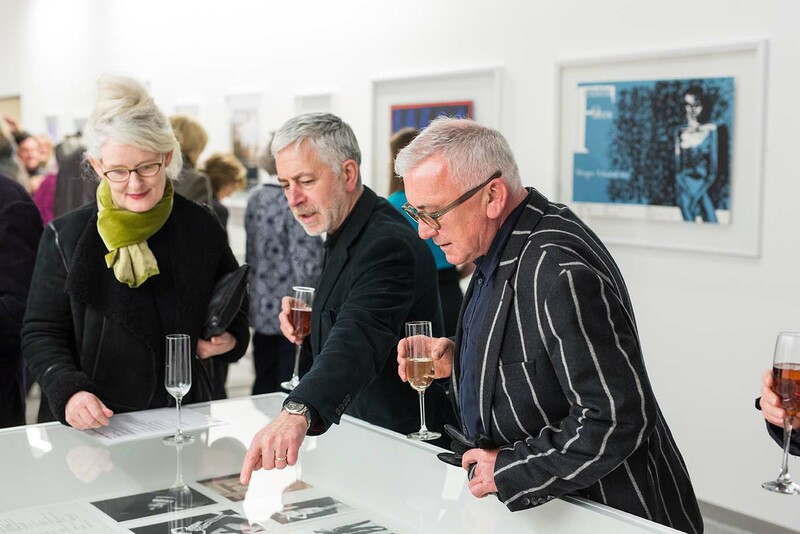 Through photographs, film, press cuttings and ephemera, many of which are held by the Archives & Collections, the exhibition depicts a visual history of this annual undergraduate event. On the 14th January 1947, students from the Art School and College of Domestic Science came together in aid of Charities Week, to present a mannequin parade of more than 30 specially made outfits. During the early years of the fashion show, local press commented on different styles of garments, from 18th-century dress to modern swimsuits. The extra-curricular nature of early shows is apparent, with students noted as working during the holidays. Reports from the 1952 event mention a student committee charged with organisation. The programme for the coronation themed 1953 show, lists a team comprising convenor, associates, stage director, publicists, treasurer, electricians, compere, graphic designer and mannequins. Unusual materials and accessories, in particular headwear, commonly feature in shows of the late 1950s and early 1960s. 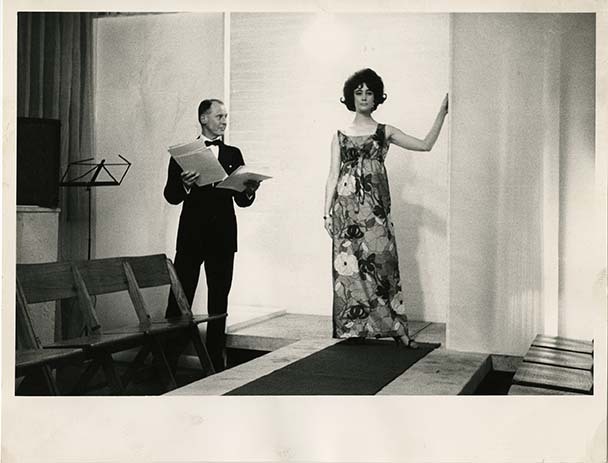 From the mid to late 1960s more wearable and functional garments appear, often displaying geometric patterning and sometimes developed due to industry connections and competitions. During this period the event relocated from GSA’s Assembly Hall, to various venues including the Mackintosh Building, with shows in the Lecture Theatre, Mackintosh Room and Museum. Shows were also held at external venues including Culzean Castle and the Scottish Design Centre. In recent years, students have regularly been influenced by the material in the Archives and Collections when producing garments for the GSA fashion show. 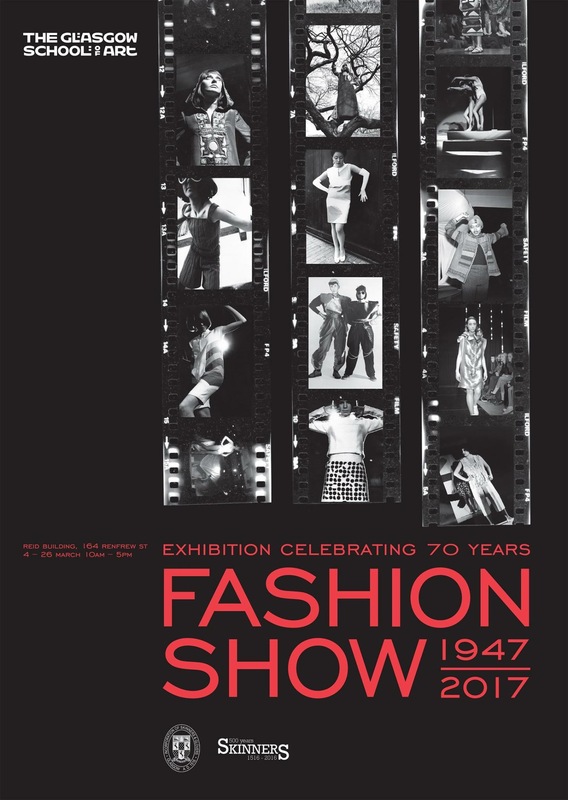 For the 70th Anniversary fashion show, 21-22 March, 3rd-year fashion and textiles students have selected a period between ‘1947-2017’ for inspiration. Tickets can be purchased from the GSA Shop or tickets-scotland.com. To keep in the loop, follow the activity on social media using the links below.